The Blue Jays opened up their 10 game road trip in losing fashion getting hammered 11-4 in Boston. The Jays lead is now down to a half game over the Yankees. The Blue Jays send R.A Dickey to the mound tomorrow night to face Boston rookie Henry Owens. Josh Donaldson had three hit day, including his 37th home run of the season which opened the scoring. Jose Bautista had a two hit day including a two run double in the eighth. Justin Smoak was 1 for 2 with a pair of walks and hit his 14th home run of the year in the fifth inning. John Gibbons for not burning through the bullpen and only using his low leverage middle relievers leaving his top relievers rested for the tomorrow. Marcus Stroman made it through his rehab start today proclaiming himself healthy and ready to go. Troy Tulowitzki’s struggles at the plate continued with a 0 for 4 day. Russell Martin also had a 0 for 4 day which included him grounding into his 19th double play of the season. Ryan Goins was 0 for 3 on the day as well. Ryan Tepera allowed three runs in two innings of work and Jeff Francis was touched up for a Travis Shaw two run homer in the eighth inning. 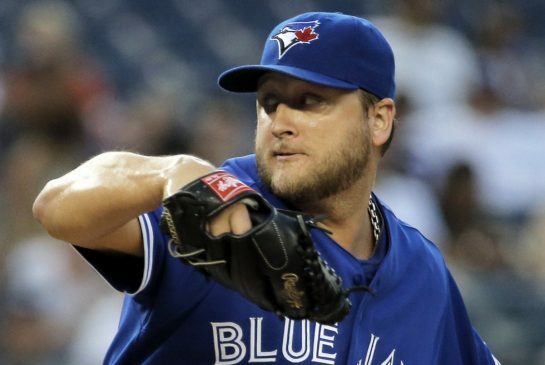 Mark Buehrle didn’t have it from the start giving up five runs on nine hits through three and a third innings. It does seem like it’ll make for an interesting discussion on just what the Blue Jays will do this weekend when it comes to bumping Buehrle back a start to get a Marcus Stroman start against the Yankees this weekend. Aaron Loup only threw two pitches on the day and neither accomplished what it’s intended purpose was, he allowed a single to Mookie Betts and then hit Pablo Sandoval in the wrist with a pitch, but the bigger question should be why was he in a game that was still within reach?